Dimitrenko: "I still have no offer to fight Briggs"
Update: Hayemaker Promotions today announced that Shannon Briggs will face Alexander Dimitrenko at Haye Day on May 21 at the O2, London (see below). 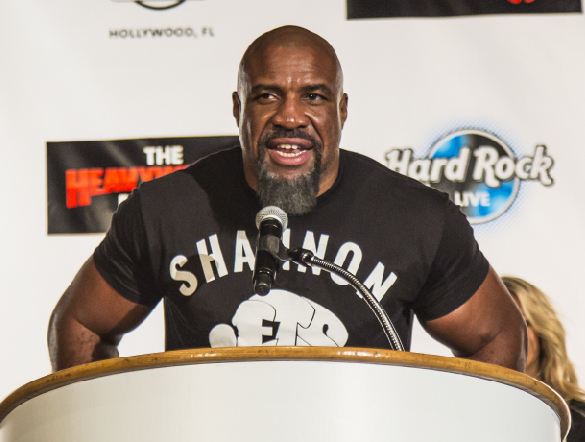 Hayemaker Promotions today confirmed that former WBO Heavyweight World Champion Shannon Briggs will face 6’7-inch giant and former European Heavyweight Champion, Alexander Dimitrenko at Haye Day on May 21 at the O2, London. The Cannon (59 (52) – 6 – 1) goes up against the Russian powerhouse knowing that a victory will set-up a much anticipated fight with David ‘The Hayemaker’ Haye later this year. Tipped as a future world champion, Dimitrenko (40-2) boasts an impressive record and will arrive in the capital with high expectations. Standing at 6ft 7″, the 33 year old German based Ukranian has both height and youth on his side. Undefeated in his last six bouts – his most recent victory came in January against Bosnian Drazan Janjanin. Commenting on the announcement, Briggs said: “I don’t care if this guy is tipped for a future World Title, I am going to take him down in London. I don’t care if this guy is younger than me, taller than me or hits harder than me. I’m in the best shape of my life and have the experience to take this guy down. I was beating George Foreman when this guy was still learning to read! Once I’ve knocked him out, I’ll focus on taking David Haye down in his home town! Dimitrenko has been tipped as a successor to the Klitschko’s reign – A dangerous opponent with impressive power. ‘The Cannon’ has been actively pursuing a fight with Haye in recent weeks and The Hayemaker has agreed in principle that, if they are both victorious on 21 May, the pair will meet in the ring later this year. Briggs has a distinguished record and is unbeaten in eight fights since losing his last World Title fight to Vitali Klitschko on points back in 2010. As well as the Ukrainian former World Champion, the charismatic American has shared the ring with a number of boxing legends including George Foreman and Lennox Lewis. Haye, who will fight undefeated Kosovan, Arnold ‘The Cobra’ Gjerjaj (29 (21) – 0 – 0), said: “I’m thrilled to say that we’ve got another quality fighter appearing on the Haye Day undercard. Alexander Dimitrenko is a big guy and a heavy puncher and a real challenger for a World Title – I think he’ll cause Briggs some serious problems. “If The Cannon does managed to walk away victorious, I’ll be surprised, but at the same time he’ll have proved his worth. It just means I get to be the one to knock him out – which is even better. Also fighting on the night is Sheikh Fahad Bin Khalid Al Thani, a member of the ruling family of Qatar. He is the country’s first ever professional boxer and he will make his debut on the undercard at The O2. He joins a stellar undercard with ‘Smokin’ Joe Mullender taking on Lee ‘Banjo’ Markham for the English middleweight title as chief support, with a host of young Brits also in action including; lightweight Floyd Moore, light welterweight Kay Prospere, light heavyweight Ollie Patterson and heavyweight Nick Webb all set to fight on the night.